Trans-Pacific eastbound ship lines say they’ll increase rates $400 per FEU in mid-April and ask for more in new service contracts. Confident that a previously announced general rate increase of $300 per 40-foot container unit will take effect on Thursday as planned, shipping lines in the eastbound Pacific announced an additional $400 per-FEU increase to take effect on April 15. The Transpacific Stabilization Agreement, a discussion agreement comprised of 15 of the largest carriers in the eastbound Pacific, also said carriers intend to negotiate new service contracts that will call for an additional $500 to $700 GRI to take effect with the beginning of the new contracting season on May 1. If carriers are successful in applying all of the proposed rate increases they have announced this year, container lines carrying imports from Asia to the U.S. will have raised their rates four times between Jan. 1 and May 1. Shipping lines appear determined to recover from steep losses they incurred last year, when they reportedly lost between $5 billion and $6 billion in their global operations. 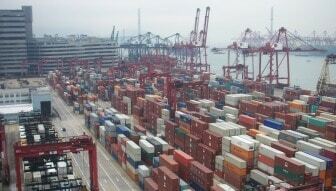 Losses were reported in a number of trade lanes, including the Asia-Europe and trans-Pacific trades. This spurred carriers to begin a series of rate increases after Jan. 1 in a do-or-die scenario in the trans-Pacific. Initial reports are that at least some of the proposed rate hikes are sticking. Indeed, the average freight rate in the eastbound Pacific increased $300 this week to $2,013 per FEU, according to Drewry Shipping Consultants. “Carriers operating in the Pacific are at a critical juncture,” said Brian Conrad, TSA executive administrator. “For any carrier rate or cost recovery effort to be meaningful in 2012-13, it must reflect an actual increase from rates in effect at the beginning of the previous year, and it cannot extend promotional short-term rates in select trade segments to all commodities and all routes for 12 months,” he said. Conrad said that in recent weeks carriers have announced consolidation of services, elimination of some service strings and ad hoc cancellation of selected sailings, especially during and immediately after the Chinese New Year celebrations in late January and early February. The determination of the carriers to return to profitability can be seen in the Drewry Container Rate Benchmark spot rates for shipments from Hong Kong to Los Angeles published each week in The Journal of Commerce. The index hit a low of close to $1,400 per-FEU in early January. Since then, the rate surged to around $1,800 per FEU and has stayed above $1,770 per FEU each week into March. Importers are skeptical that shipping lines can continue to raise their rates at will, given the excess vessel capacity that continues to plague the major east-west trade lanes. The TSA sets voluntary guidelines for its members, but has no enforcement powers. The 15 carriers are free to set whatever rates they wish in confidential contract negotiations with customers.